First things first....a big congratulations to The Badass Geek who is my virtual lunch date. Thank you all for your wonderful comments and genuine excitement for me and the great news from last Monday. I will be sending Michael a $20 gift card for a dine out experience at a restaurant he picks. Michael, email me your pick and your address. And for a little more blog love, this time to Tidy Mom for this recipe that made my mouth water. The recipe and photo are from her site. I am making this tomorrow! A perfect soup for autumn and a great alternative to red chili. Mmmmmm. Buon Appetito! Have a great Saturday. Heat your oil in a dutch oven over medium heat, add onion, garlic, and spices. Saute for about 5 minutes. While that is sauteing, season cut chicken with salt and pepper and add to the pan. Saute for an additional 5 minutes. Drain beans. Reserve 1/2 cup of bean liquid. Add beans, chicken broth, chilies, cream and reserved bean liquid to pot. Simmer for about 10 minutes, then cook on low for about 30 mins. Serve in bowl and top with cheese! (This can be prepared a day ahead - it's even better the second day!) You may want to double the recipe as the above makes five servings. Yummmmmm. Congrats to Michael! JM, we eat a version of this chili regularly. It is very, very, very good! Hi and happy SITS Saturday Sharefest. How did you know that I was looking for a chili recipe? Anyway, I was scanning your blog and saw that you were asked to do an interview based on one of your posts. Which one? I would love to read that you had to say that caught their attention. Glad I found your blog. I'll be back. Yay! I've been looking for a recipe for this for.e.ver. The chili looks so good and would be perfect on this chilly rainy autumn day. I am more excited about this than I probably should be. I never win things. Thanks for sharing... I might just try making this. We don't eat chili here a lot. YUMMMMY! And congrats to Michael! Enjoy your lunch! Congrats to Michael!! This was a great idea! Very fun. Congratulations to the winner and have fun on your virtual date. This chicken chili sounds SO GOOD and our chili/chilly weather just arrived, so I'm excited to try it out. Thanks for stopping by my blog and you have a new follower (lil' ole me!). Hope you're having a great weekend! Congrats to you again and to Michael. 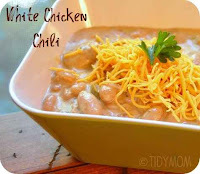 I love - love White Bean Chicken Chili. Can't wait to try this recipe. The best I've ever had was from Olga's Kitchen, a small chain restaurant. Yours has chilis so it sounds like theirs. Yummy! I love that recipe. I have one that's very similar and I came this ____ close to posting it last week and then I quit my job and that threw my mood off. Yours sounds better and I crave chili when the weather gets colder. I'm going to try this soon! CHicken Chili is my favorite kind of chili! Thanks for the recipe! YUMMMMM! Congratualtions.....I have a great giveaway on both my blogs that will be given away this weekend....and all you have to do is comment.......so hope you will stop by. Congrats to the winner Michael. Are you sure you didn't mean to type Michele? My Hubs likes the white chili better than the other kind. Perfect for tonight while watching SEC football! 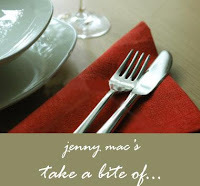 JennyMac when can I come to your house for drinks and dinner. Please. Arggh, I am on a temporary low fiber diet but that's chili is on my list when I get healthy again. Ooooohhhh...delish! That sounds heavenly! I can't wait to make it! And congratulations to Badass Geek! Congrats to the winner. That's fabulous! The recipe looks delicious too. I have been browsing around on your blog and I must say I have enjoyed my visit! This post looks to be mouth watering and I would also like to offer my congrats to the winner of the gift card! The hubs is all about trying out new chili recipes. I'll have to share this with him! Congrats to the winner and I have to try that chili recipe. I wonder if I could make this in the crockpot. I don't see why not. hi jenny..u r so prommising about the dinner ..:) ..congrats to the winner and thanks fr the nice recipe. Mmm, I love white bean chili! I will try this out on the kids this week. This recipe sounds so perfect, thanks so much for sharing! Congrats to the winner. Hope he picked someplace yummy!! I'm going to try this tomorrow. Must remember to let you know how I get on. Anyway, your blog is ace - the looks is fantastic. Check out my dating nightmares if you get a minute and keep up the good work. This recipe looks so delicious, btw. Thanks for sharing this!